Kimai can be localized to any language and we ship the following sets of translations: english, german, russian, italian, french, spanish, hungarian, arabic. Feel free to send your self-made language files – we’re looking for translators and would appreciate your support! And if want to know what others have to say about us, check out the testimonials. The following list is **not** complete, but instead it should highlight some of the exciting features which Kimai v2 offers. The layout is fully responsive, based on bootstrap and made for desktop and mobile usage. Kimai v2 was built with extendability in mind, the feature set can be extended with plugins. Kimai v2 can be used by as many users as you want: each installation supports unlimited users with different roles (see permissions). Kimai can be localized to any language and comes with a set of translations (but we always look for help). Manage your customers and set address, contacts, country, currency, visibility (for archiving) and many more fields. 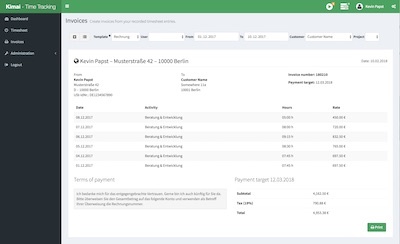 Manage projects for each customer with order number, budget and visibility (for archiving). Activities are used to record timesheet entries. Manage activities for each project with order number, budget and visibility (for archiving). Different templates, calculator, invoice number generator and you can add your own templates, in the file formats: XLSX, ODS, CSV, DOCX. Timesheet data can be exported for usage in other programs, passing them to different departments or simply for having an offline record of your work. Featuring a JSON API so external apps can communicate with your favorite time-tracker! 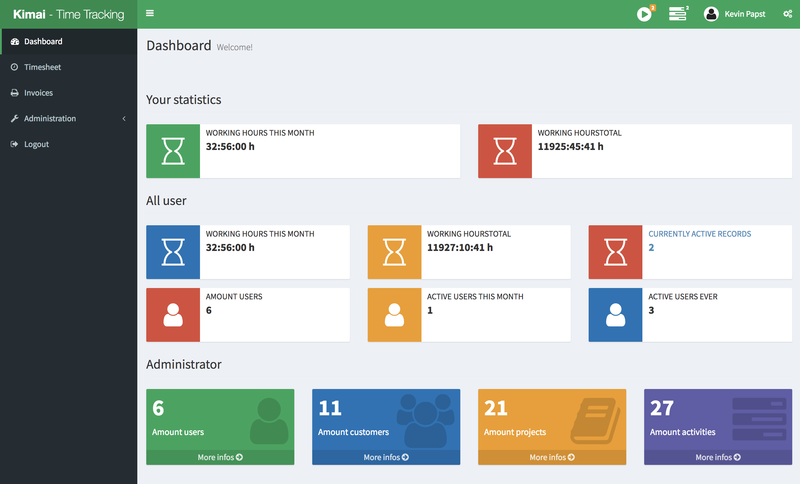 Your dashboard will show you several statistics about recorded times and the amount of collected data. And we can always add more charts! The release includes a docker image for development and there is a separate docker-compose setup for production available. Data from Kimai v1 can be imported, for a seamless migration of your time-tracker. You can record as many times as you want in parallel, but you can also config the allowed limit of active records down to 1. Kimai uses localized version of the 24 hour format. But if you are used to the am/pm format, you can configure that. If your local laws require you to only show durations instead of start and end date-time, you can activate that mode globally. Rates can be calculated based on hourly and fixed amounts, configurable for customers, projects, activities and each timesheet record individually. You can filter all time-records by user, customer, project, activity and date. You can configure global settings for rate factors on single weekdays, e.g. 150% for saturday and sunday. After a long usage a lot of entries can pile up in your dropdowns - now you can hide customers, projects and activities. Assign different roles to your user: User can record times, teamleads can print invoices and configure project/activities, admins can configure users and customers. Personal statistics and per user settings for hourly rate, Kimai theme, password and avatar. Kimai supports user self-registration with email activation. Forgot your password? No problem, Kimai got you covered with an password reset functionality via email. No database setup required, Kimai has SQLite support out-of-the-box.